Provides the ability to create regions in XML and XAML code. Unfortunately, due to the way the new VSIX file is structured, I had to abandon the backwards compatability with Visual Studio 2010 to 2015. The old version, which has exactly the same features and works in VS 2010-2015, is available here. Pay special attention to the lack of space between the #region and #endregion and the "<!--". Also, it appears Microsoft's implementation is restricted to only XAML, and does not work for XML. Added support for Visual Studio 2017. This new build only works in Visual Studio 2017. For compatability with Visual Studio 2010 to 2015, please download version 0.12 version here. 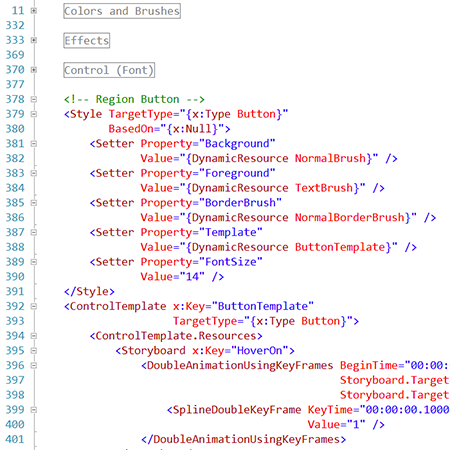 A small extension that adds the ability to define collapsable regions in XAML & XML code. It recognizes region definitions that are defined inside of XML comments so that code designed using this extension will have no problems compiling in environments that do not have this extension.